The pure brass lamp is a very popular lamp decoration on the market. Compared with the lamps made of other materials, the pure brass lamp, including the glass soldering lamp, is mainly made through the process of covering the edge of the glass with brass strip and welding. The pure brass lamp can present a retro style and well fit with the environment decorated with European or retro style. In order to have a better decorative effect, there are multiple attentions and skills for choosing the pure brass lamp. The first is to look at the surface color of the lamp. The surface of the high-quality pure brass lamp is evenly covered with protective film that can isolate the air to avoid oxidation on the surface and make the brass lamp more lustrous . The second is to consider the workmanship of the lamp. The high-quality pure brass lamp reveals smooth and natural design and better highlights the essence and merits of the lamp, making the lamp more exquisite and elegant. 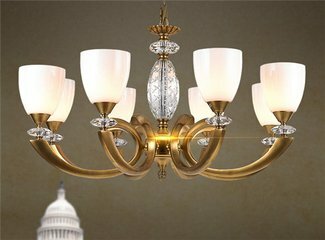 The premium pure brass lamp has uniform and even color and perfect shape and carving, without any spot on the surface except the high light dots. Details of the pure brass light also need be noticed. The high-quality lamp shall be polished meticulously and shall be smooth and mellow, with the special cool feeling of brass. Generally speaking, the brass lamp is not merely a complementary light source, but also a decoration matched with other lamps. In order to improve the overall lighting effect, the selection of downlight products shall also be combined with the actual conditions.